An Oregon hunter fell from his treestand and hung upside-down before two hunters heard his cries for help. The most dangerous part was the rescue. A hunter in northeast Oregon fell from nearly 30 feet above ground and found himself entangled in his safety harness, hanging upside down for two days. Eddie Voelker, of Prineville, Oregon, is 70 years old and is last reported in a medically induced coma in a nearby hospital. “Crews removed him from the tree using a bucket truck from Oregon Trail Electric Co-op. Voelker was life-flighted to Kadlec Regional Medical Center in Richland and, according to staff there, is still in critical condition. 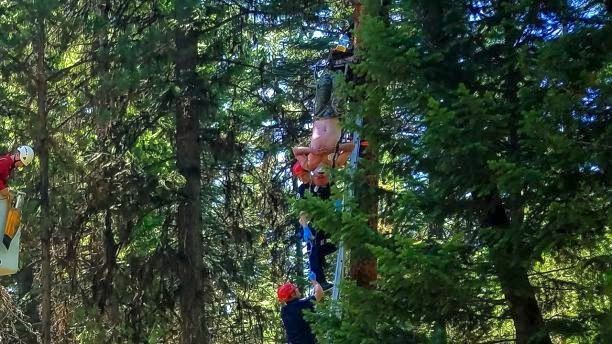 A 70-year-old Oregon hunter was rescued after hanging upside-down for two days about 30 feet above ground. Photo: Umatilla County Sheriff's Office. Two hunters heard Voelker yelling for help. But Voelker’s cries for help echoed in the woods in a way that made it difficult for the two hunters to pinpoint the fallen hunter’s location. As a result, they went back to their vehicle and drove around to cover more ground. The hunters-turned-rescuers couldn’t free Voelker, so they went for help. On the way, they flagged down a car and asked the passerby to sit with Voelker until they returned. They returned with a rescue helicopter, but the flight crew didn’t have the right equipment to get Voelker down. “About 30 people from all different local agencies arrived, but no one had equipment that was tall enough to reach him. “Then, a paramedic with the La Grande Fire Department remembered seeing the local electric utility training with their bucket trucks to rescue linemen who are injured on the job. The rescuers called Oregon Trail Electric Co-Op and made the unusual request for help. Ultimately, the U.S. Forest Service set up a rope system to slowly lower Voelker into the bucket, and as they started to do that, his medical condition deteriorated at an alarming rate. The hunter’s heart stopped briefly and rescuers performed CPR on the scene before air-lifting him out. "We knew the likelihood of cardiac arrest is extraordinarily high. We knew we couldn't barge in and put him in the (bucket) truck without doing treatment first," Tibbetts said. "We were forced to slow it down a bit and deal with the medical side of it while developing a plan for the actual rescue." Jacoby, the friend of the hunter’s family, told East Oregonian that Voelker's loved ones returned to the site to bring home his hunting dogs, which had remained with him during the two-day ordeal. How Common Are Treestand Falls? If 20 avid hunters were gathered in a room, research shows that one among them will fall from a treestand in his or her lifetime. And, according to Safety Research & Strategies, the use of a safety harness alone can sometimes lead to fatalities for a variety of reasons, namely due to something called suspension trauma. But the hunting industry and non-profit and governmental agencies are being aggressive about providing educational information and innovative gear to prevent injury or death from treestand falls. But the hunting industry and non-profit and governmental agencies are being aggressive about providing educational information and innovative gear to prevent injury or death from treestand falls. Pictured is the Emergency Descender. It's a new, automatic and hands-free device available to hunters this season. Click the image to watch how the hands-free device works. Last month, Grand View Outdoors partnered with Primal Treestands, a hunting-centric manufacturer who just introduced the Emergency Descender. It's a new, automatic and hands-free device available to hunters this hunting season. As part of it's campaign to launch fall products, the company produced educational content on treestand safety guidelines developed by the Treestand Manufactuer’s Association (TMA), which included interactive quizzes posted to social media and data on treestand falls and common health hazards that can occur when a hunter hangs from a treestand for long periods of time. The association also advises hunters to carry emergency signal devices such as a cell phone, two-way radio, whistle, signal flare, PDL (personal locator device) and flashlight on your person at all times and within reach, even while suspended. In the case of the Oregon incident, one of the main barriers to rescue was the hunter’s inability to capture the attention of other hunters or people within the vicinity of his treestand. Prior to the two hunters who ultimately discovered Voelker, two other hunters heard Voelker’s cries but failed to locate the fallen hunter. You can download a PDF of the TMA’s treestand safety guidelines here.